Blueberries are a tasty fruit that have recently gained fame for their numerous health benefits. While some people may prefer to eat fresh blueberries, blueberry juice is also a healthy option. In fact, blueberry juice can help improve digestive and urinary health, improve cognition and reduce the risk of heart disease. Blueberry juice can be useful when it comes to improving digestive health, according to the book "Nutrition Therapy and Pathophysiology." In fact, blueberries are a rich source of a biochemical known as tannin, which can reduce inflammation in the digestive tract -- and reduce rates of both constipation and diarrhea. Tannins, which work as Helicobacter pylori antagonists, also improve the digestive system by contributing to reductions in peptic ulcers. H. pylori is often identified as a primary cause of peptic ulcers in adults. People who consume blueberry juice may experience enhanced urinary health, reports "Nutrition Therapy and Pathophysiology." This occurs likely as the result of antioxidants called proanthocyanins which make it more difficult for certain types of bacteria, including E. coli, to infect the urinary system. In addition, blueberry juice is a rich source of vitamin C, which may also provide relief for men and women who suffer from urinary tract infections. An 8-ounce serving of 100-percent pure blueberry juice contains 20 percent of the daily recommendations for vitamin C.
According to a 2010 article in the "Journal of Agriculture and Food Chemistry," blueberry juice can help improve memory and cognition. In addition to slowing declines in mental function that often occur as a result of aging, blueberries may be able to reduce the risk of certain mental health disorders, including Alzheimer's disease. "Nutrition Therapy and Pathophysiology" suggests that this improvement in cognition likely occurs as a result of the high flavonoid content in blueberries. Flavonoids, such as those found in blueberries, may be especially effective in improving working memory and processing speed. 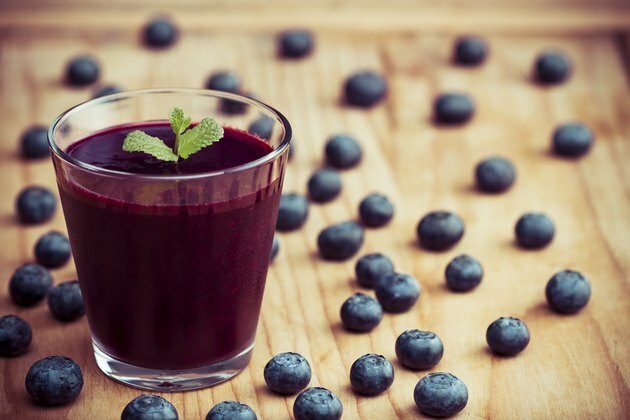 Blueberry juice may also be effective for the prevention of heart disease. In fact, a 2010 article in the "American Journal of Clinical Nutrition" notes that anthocyanins -- pigments found in blueberries and blueberry juice -- can be effective at lowering blood pressure levels when consumed at least once per week. Low blood pressure levels, such as those less than 120/80 millimeters of mercury, can reduce your risk of stroke and heart attack, reports a 2002 study found in the journal "Lancet." In fact, reducing blood pressure values by as few as 10 points can result in a 50 percent decrease in cardiovascular risk. Nutrition Therapy and Pathophysiology; Marcia Nelms et al. What Are the Benefits of Cranberry Juice for Women?